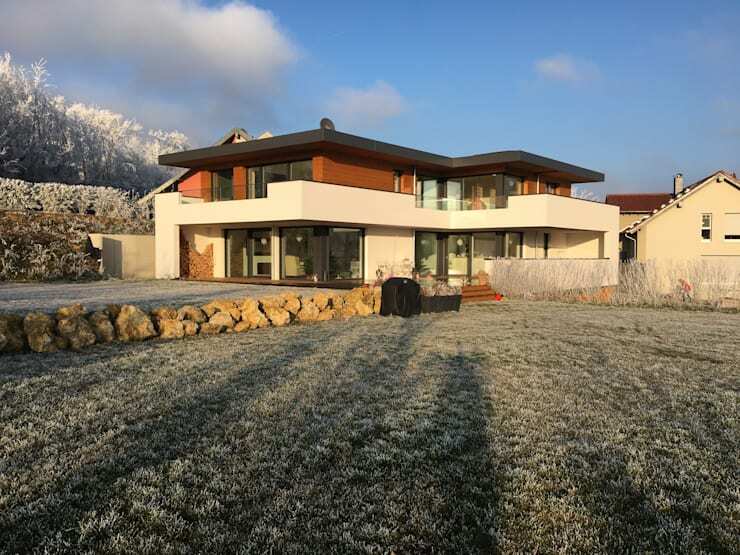 We're looking at a chic home with an Alpine twist. This home has ultra modern white interiors and incredible design. The architects at Gerber created this dream home. We’ll see a strong palette of contrasting white, black, and natural wood as a common thread through every space of the home. The natural beauty of the surrounding landscape helps to guide the design ethos. It’s an idyllic Alpine getaway home that has chic modern interiors. Let’s take a look and start our tour! 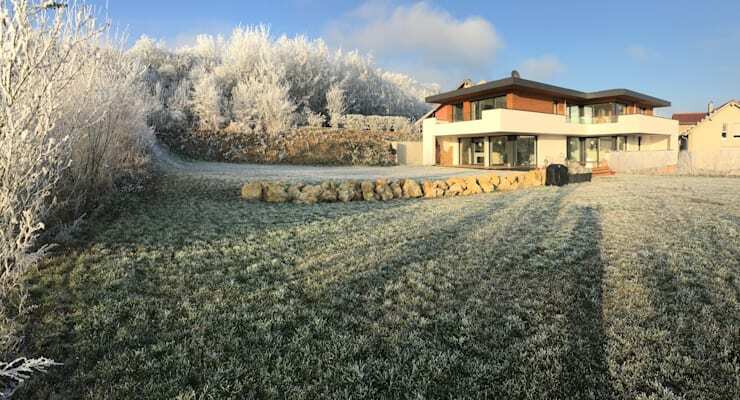 The home has unobstructed views of idyllic Alpine hills and sits at the edge of a field. 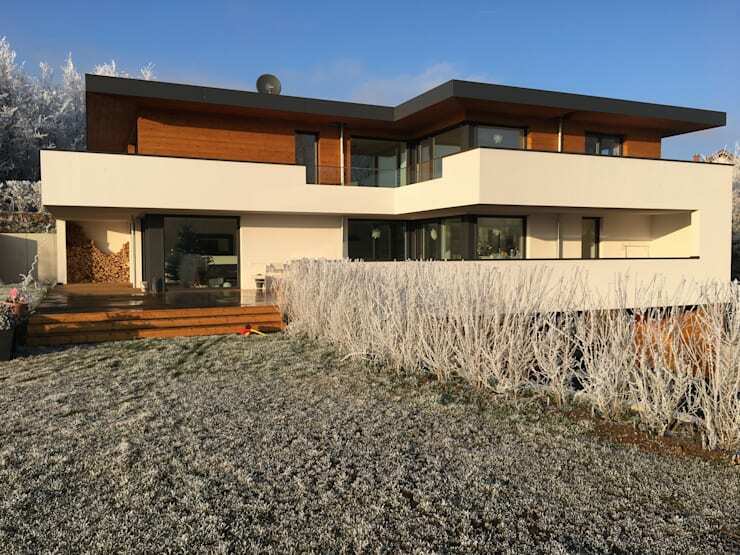 We love the photos of the house taken after a dusting of snow. The sleek facade of the home is an intriguing melange of wood, white, and a black hipped roof that appears flat. The contrasting blocks of colour create a sense of curiosity about the home. Closer to the entrance of the home, we can see the white balcony that wraps around the second level of the home. An expansive deck outside will be inviting come summer time. In the winter, the occupants will probably be busy staying toasty warm and looking out over the Alpine hills. Clever window placements and lighting tricks help make the foyer in the home feel modern and bright. Natural wood panelled walls warm up the interiors and are balanced out by the cool grey floors. Minimalist furnishing and decor reflect a modern less is more mentality. Light pours in from above through the glass panels that we’ll take a closer look at once we’re upstairs. The ultra modern kitchen looks like it’s from the future. 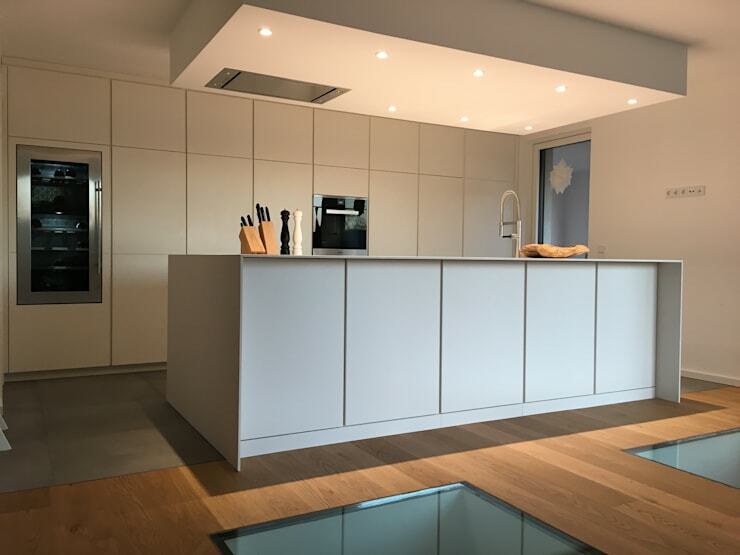 In the centre, a kitchen island and light panels on the ceiling brighten up the kitchen. Shelving from the floor to the ceiling creates hidden storage space for the kitchen utensils. 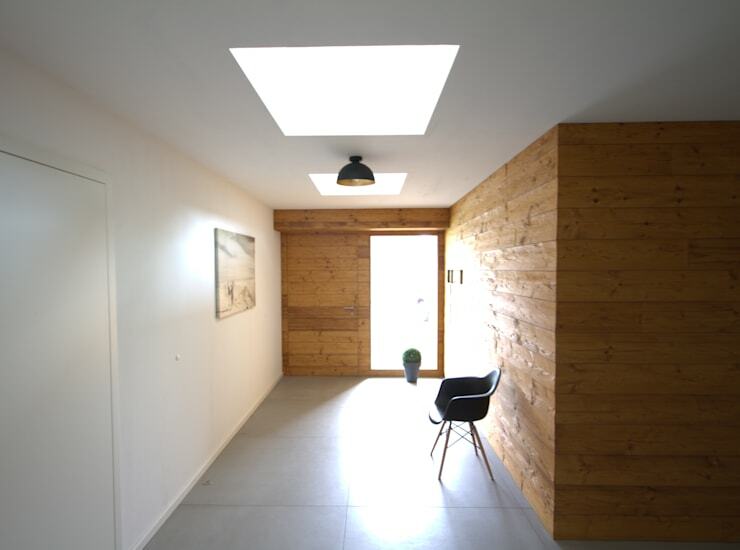 One of the special details of the home are the recessed wooden floor square windows. They let light down to the lower level in a fun and unique way. Sleek and futuristic, this kitchen is incredibly cool. Next to the open kitchen is the dramatic dining room with a double height ceiling. 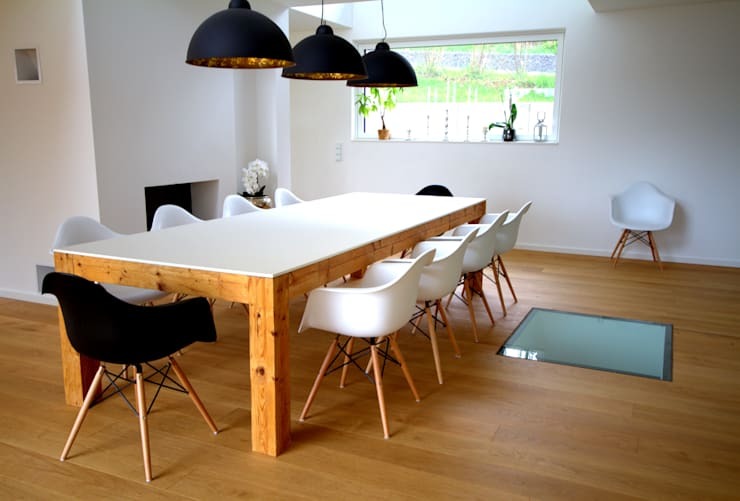 It features a heavy wood table and anchors the home around itself. Eating together becomes the heart of the home. The airiness and lightness of this dining space combine with warm furniture to create a comfortable atmosphere. Even in the bathroom, we see the design ethos reflected. 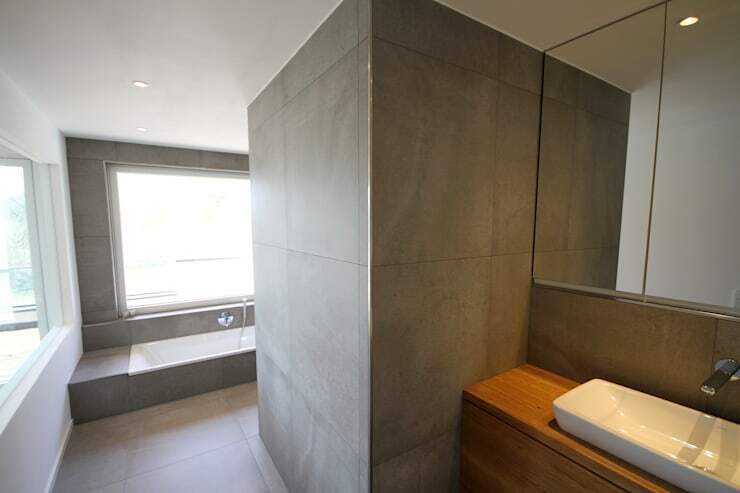 The distinctive combination of wood, white, and grey come together in this spacious bathroom. Large windows bring in natural light to make everyday showers a tranquil experience. The wood cabinet creates functional counter and storage space. This sunken bathtub so elegant that it looks like it belongs in a spa. The staircase leading from the dining area up is wonderfully delicate and straight. The wooden steps seem to float. 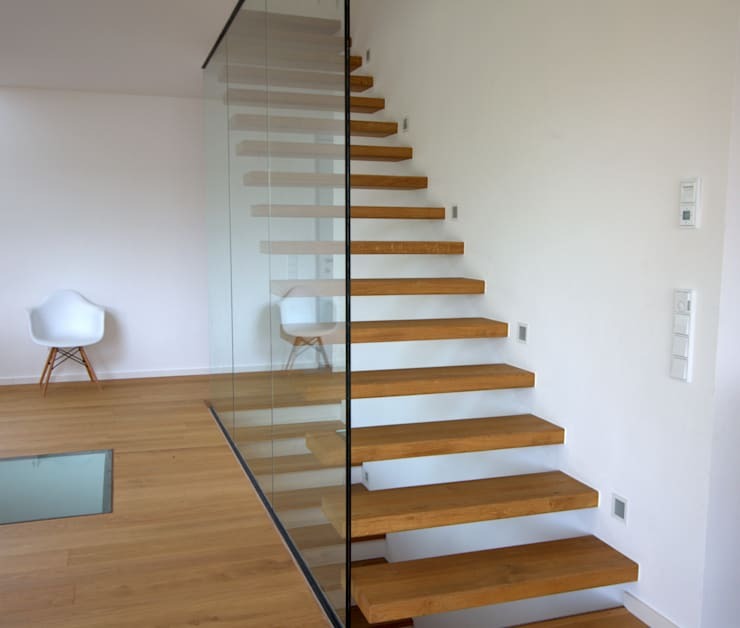 The choice of transparent glass goes with the prevailing lightness of the interior. When the property is dusted with snow, it looks like a gorgeous little Alpine getaway. We hope you enjoyed our tour of this ultramodern home! Next, check out our feature on an eco-friendly vacation home you'll never want to leave! What are your thoughts on an ultramodern interor like this?